It’s 1945 in the bar of the La Fonda Hotel, in Santa Fe, New Mexico, thirty miles from Los Alamos. People from the town meet to drink, gossip, and trade theories about the activity on the Hill, where the scientists of the Manhattan Project are developing the atom bomb. In the midst of the political turmoil, a young Los Alamos engineer falls in love and, torn by a battle between his patriotism and his conscience, is forced to confront a future that might threaten his family. La Fonda was developed at Luna Stage and received public staged readings at the Jersey City Theatre Center, presented by Writers Theatre of New Jersey; at the Bickford Theatre presented by Luna Stage; and at Nora’s Playhouse in NYC. La Fonda was named a Semi-finalist in the Premiere Stages Play Festival. In iDream, three young women, Khadi, Theresa, and Amanda, confront their career options after high school. When they are encouraged by a dynamic teacher to explore the male-dominated field of computer technology, they begin to discover their places in the world, all the while struggling with the personal, family, and academic obstacles that might prevent them from following their dreams. Art and science converge in this highly topical exploration of career opportunities in the twenty-first century. iDream was performed at Premiere Stages in New Jersey, at the State Theatre in State College, PA, and at the National Science Foundation Conference, Washington, D.C.
Françoise Bollinger, eighty and ill with only a short time to live, is frightened to die with a terrible sin on her conscience. While grappling with her past to find forgiveness for her actions, she relives the summer of 1944 in France and remembers studying dance with one of Isadora Duncan’s protégées and falling in love with a German soldier. She struggles to navigate between past and present as a compassionate doctor and troubled granddaughter witness her search for redemption. Françoise was developed at Luna Stage in New Jersey and received a staged reading by Nora’s Playhouse at the AIR Gallery in Brooklyn, New York, where Kathleen Chalfant read the title role. Françoise was named a Finalist in NYC’s Boomerang Theatre First Flight New Play Festival, a Semi-Finalist in the Long Island Theatre Collective Contest, and was recently nominated for the Kilroy List. In the summer of 1913, at Viareggio, Italy, Eleonora Duse, foremost actress of her day, invites Isadora Duncan, foremost dancer of her time, to recuperate following the deaths of Isadora’s two children. In the days following, these towering artists of the early twentieth century revisit their pasts and engage in a passionate contemplation of love, motherhood, and art. It would prove to be a transcendent time for both of them. Katrina: the K Word, based on interviews conducted with New Orleans’ residents in 2007, is inspired by true stories of individuals facing one of America’s most challenging crises. Both tragically heartbreaking and poignantly uplifting, Katrina: the K Word chronicles the journeys of New Orleans’ residents whose lives are forever changed. Some choose to wait out the storm; some can’t get out. Some create a new life elsewhere, while others return to help rebuild a broken city. Produced by Playwrights Theatre of New Jersey and on campuses in thirteen states and the District of Columbia. In 1991, Charlotte Cranford travels to the Soviet Union to direct a production of Streetcar Named Desire with a Ukrainian cast. She battles the language barriers and cultural customs, finds herself in a love triangle, and struggles to get the show up, only to become enmeshed in the military coup that toppled the old order and changed the Cold War forever. Rehearsing Desire had a staged reading by Nora’s Playhouse at the Actor’s Guild Hall in NYC. After living for decades in New Jersey, a widowed Mona returns to Las Vegas, her childhood home. She moves in with her brother and decides to jumpstart her life and face past crises by restoring the family business. Meanwhile, Tony, her hairdresser employer, wants to block his memories of 9/11 and the loss of his partner and the life they shared in New York. Las Vegas is the perfect place to lose himself and move on. A jigsaw puzzle competition could be the answer to Mona’s dream and the glue that cements her relationship with Tony. NYPD homicide detective Cordelia Lear is back on the job, a year after her son was kidnapped and murdered. But going back to a life changed forever is never easy and she is unprepared for her first case – one of New York City’s elite has been murdered and the only witness may be his wife suffering from dementia. As secrets start to come out in the investigation, Cordelia must struggle not just to solve the case, but to try to hold the pieces of her fragile world and wounded soul together. Grace Dearborn has lived the life she thought she always wanted with a husband, a son and good friends. But when her husband leaves her for a younger woman, her best friend’s battle with cancer worsens and her son proves to be a disappointment, Grace is forced to reexamine everything she once took for granted and is led to question whether or not it is too late to live life on her own terms. In 1991, Laura Cranford is persuaded to travel to the Soviet Union to direct a production of Streetcar Named Desire with a Ukrainian cast. She battles the language barriers and cultural customs to get the show up, only to find herself enmeshed in the military coup that toppled the old order and changed the Cold War forever. Dodie is at it again when the Etonville Little Theatre produces Arsenic and Old Lace and life imitates art. The guest director dies over a plate of knishes at Dodie’s1940s theme food festival. To save the reputation of the Windjammer restaurant, she sets to work, foils a dangerous plot, and saves Arsenic and Old Lace as well as her budding romance with Chief Thompson. 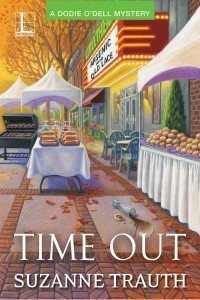 By opening night Dodie’s ready for a time out! Dodie O’Dell has moved to quiet, cozy Etonville, New Jersey to escape the devastation of Hurricane Sandy and start a new life as a restaurant manager. But mayhem erupts at the Etonville Little Theatre and a man is murdered, the hunky police chief is new to small town life, and Dodie must solve the mysteries before the show can go on! When her recently deceased father unexpectedly leaves a generous bequest to a total stranger on another continent, Kate Whitman embarks on a journey of self-discovery that takes her back to the south of France in 1944 and the unsettling truth about her father’s wartime love affair. Katrina on Stage: Five Plays documents an unprecedented time in American history. This anthology of five plays gives artistic expression to Hurricane Katrina’s devastation, particularly at the level of individual lives forever altered, and tells the kinds of stories the news media could not. It explores the deeply rooted problems plaguing New Orleans and illuminates many social, political, and environmental issues central to American life. The book illuminates Stanislavski protégée Sonia Moore’s life, texts, research, and teaching and provides artists and educators insight into Moore’s professional persona and the woman behind it. This thoroughly documented book should be on the shelf alongside works by and about Lee Strasberg, Stella Adler, Robert Lewis, Sanford Meisner, and Harold Clurman.